For many of us as we get older, it becomes easier to lose our train of thought. We might forget a name or an important date that was just on the tip of our tongue. We might put something down, then forget where we put it a few minutes later. Or we might find ourselves mid-sentence, trying to remember the point we were trying to make. According to a recent study out of Georgia, these mental lapses might be due to a phenomenon referred to as “mental clutter.” Thanks to this research, relatives and senior home care providers for the elderly now have a better understanding of where so-called “senior moments” come from and how to combat them. Researchers at the Georgia Institute of Technology performed this study by having college students and 60+ year-olds perform a simply memory task while hooked up to an EEG to monitor brain activity. During the study, they found that seniors’ minds tended to suffer from an excess of irrelevant information. This “clutter” made it difficult for seniors to remember certain details. Equally important, this clutter made seniors less confident in their own memories. This lack of confidence, researchers say, may be the reason why seniors are more prone to scams and misinformation than other individuals. While many people think of senior home care as primarily consisting of physical assistance, care workers also help seniors cope with the mental effects of aging. In fact, one of the biggest benefits to senior home care is the level of protection it provides. Not only do caregivers help seniors get through moments of confusion, they also give seniors someone to turn to when potential scams arise. Do you have an elderly loved one who struggled with “mental clutter”? If so, senior home care from Visiting Angels can help. 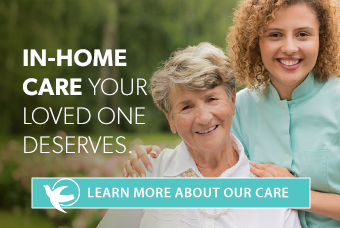 Call your local Visiting Angels office today for a no-cost, no-obligation senior home care consultation.